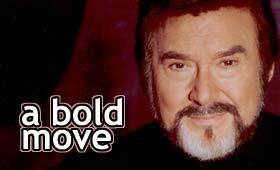 Though he vehemently denied the rumor, Joseph Mascolo will indeed by joining the cast of The Bold and the Beautiful later this month. It's been more than two months since Mascolo exited his role as Stefano DiMera on Days of our Lives. Mascolo's exit with the show was amicable, but it was clear that the actor definitely wanted to remain on the show's canvas. In March, a message appeared on Mascolo's official web site claiming that his contract talks with the network had broken down and that he'd be leaving the show when his contract expired. A day or so later, the message was rescinded and a post was made claiming that the first note was a fraud. In the end, however, the first message appeared to be accurate. Though Mascolo says that he bargained "in good faith," talks apparently did break down and Mascolo exited the show on June 14th. Even before Mascolo's exit from DAYS was official rumors of interest by B&B hit the net. Soap Central first reported that Mascolo was being courted by B&B in April. It was said at that time that Mascolo would possibly play a love interest for actress Darlene Conley's Sally Spectra. Now, Soap Central has learned that Mascolo will play Massimo Marone, an "importer/exporter" on the show. Instead of sharing a past with Sally, Mascolo's character will be associated with Stephanie Forrester. It's unclear if this implies any sort of past or present romance. As for Mascolo's character on Days Of Our Lives, the show has not ruled out the possibility of recasting Stefano. Mascolo was scheduled to tape his first B&B episodes on August 6th. He'll make his on-air debut on August 23rd.